Paul was born October 15, 1931 in Cincinnati to a railroad yardmaster, George E. Giblin, and Lucy Giblin of Greenhills. Paul attended Roger Bacon High School and graduated in June of 1949. Eight months after graduating, Paul enlisted in the United State Air Force during February 1950. He took basic training at Lackland Air Force Base and Military Police School at Camp Gordon, Georgia, and shipped to Japan during the Korean War. Six months later, Corporal Giblin was assigned in Korea. After 18 months abroad, Sergeant Giblin returned to the States and Parks Air Force Base in California. Staff Sergeant Giblin was honorably discharged on February 8, 1954 with a United Nations Medal, Presidential Unit Citation, American Defense Medal, and Good Conduct Medal. For short periods of time during 1954, Paul worked for Hilltop concrete on Airport Road, Standard Oil of Ohio on Tennessee, Cincinnati Gas and Electric, and driving a truck for William Blanton. On March 7, 1955, Paul joined the Cincinnati Police Division as a Police Recruit. On June 13th he was promoted to Patrolman, issued Badge 125, and assigned to District 7 (813 Beecher Street). Patrolman Giblin was rotated to District 1 (1024 York Street) during January 1956 and again to District 4 (7017 Vine Street) during January 1957. He was one of the first group to be promoted to Police Specialist on February 27, 1966 and was issued Badge PS-125. Then, on November 19, 1967, he was promoted to Sergeant, issued Badge S-28, and assigned to District 7. 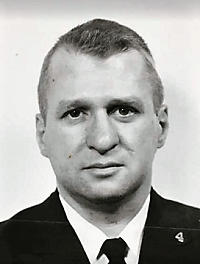 During the mid-1970s, Sergeant Giblin was one of the first Cincinnati Special Weapons and Tactics (SWAT) Team supervisors. He also served in Districts 6 (3295 Erie Avenue) and 4 (by then, 4150 Reading Road). On November 11, 1986, Sergeant Giblin retired with 35½ years of service to his country and community. During 1985, Sergeant Giblin’s daughter, Kathleen Giblin, followed him into the Police Division as a Dispatcher. Then his son, Patrick Giblin, joined the Division as a Police Officer in 1989. By the end of 2017, Sergeant Giblin, in failing health, was residing at the Sem Haven Health Care Center in Milford. He passed away on March 29, 2018 at the age of 86; at the time the 5th longest living Cincinnati Police Sergeant. Sergeant Giblin was predeceased by his wife of 54 years, Elizabeth M. (Condon) Giblin (2011); children, Stephen Giblin (1994) and Yvonne Giblin (1975); and brother, Richard Cooke. He is survived by his children, Donna (Eric) Heineke, Kathleen Giblin, Patrick (Polly) Giblin, Jeffrey Giblin, and Joseph Giblin; grandchildren, Anna, Lain, and Hayden; and siblings, Rita Hoeper and Sr. Mary Delores Giblin SND. Visitation will be held Wednesday, April 4, 2018 from 5 p.m. to 7 p.m. at T. P. White & Sons Funeral Home at 2050 Beechmont Avenue. An FOP Service will be held at 7 p.m. A Mass of Christian Burial will be celebrated at 10:30 a.m. on Thursday, April 5, 2018 at Guardian Angels Church in Mt. Washington.